Hi, Barbara Washington here with my Thursday guest designer card. 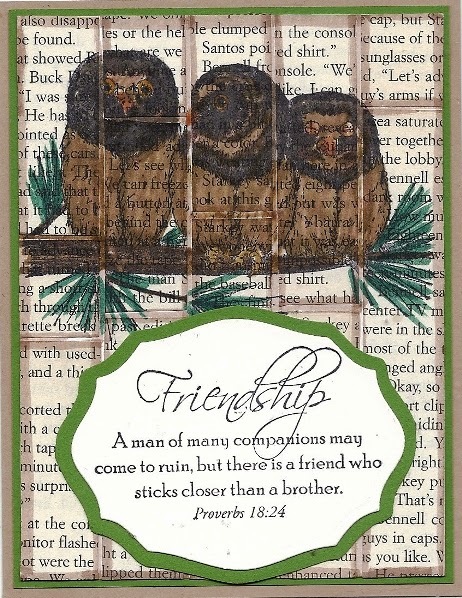 Today, for the anything goes challenge, I took the opportunity to use a set of SweetStamps stamps that I have been wanting to use -- Screech Owl Chicks and Scripture duo. I love these owls. They are so adorable. The sentiment that comes with them is so awesome. To create my card, I started with a kraft base card. I got the background technique, aged text boards, from Technique Junkies. The text is from an old discarded book. I stamped the owls right on the background and used distress markers to color them. The sentiment was stamped and die cut. Check out the new weekly and monthly challenges. We'd love you to join in on the fun. Barbara- I love this card- the technique is great and the image is fab! What a beautiful card, love the owls over that background. Looking forward to next weeks creation. What a pretty technique, Barbara. I think it is just beautiful with this stamp set!